Policies are rules of laws imposed to ensure the implementations of tactics chosen to fulfill the needs of a strategy that is support of a goal or objective. A goal or objective is often part of a project or a solution to a problem. A suite of policies or tactics comprise the means by which the strategy will be carried out. Single policies rarely are sufficient to cover the entire scope of a strategy. Finally it may also take several strategies to achieve the goals need to solve a particularly difficult problem or complex project. In this case the problem we are going to tackle is the not-so-recent rise in greenhouse gas concentrations (especially CO2 from human activities) that appears to be causing significant imbalance in the heat flux of the planet resulting in a net warming of the atmosphere, ocean, and ultimately of the earth. This warming is a problem because it is insidious. The warming is very slow on a human time scale, so slow that most people who are younger than about 50 years old really are unable to say they have any experience of a warming trend. This means that the understanding of global warming is essentially from being told that it is happening, not from being able to personally say that it has been obvious in their lifetimes. Furthermore, the defined danger from global warming is a creeping danger that will last generations if not brought under control fairly quickly. So the danger for most people is not personal and certainly not perceived to be personally life-threatening. This makes it easy to stand by and debate what should or should not be done. For our children and grandchildren, who have not yet really felt the effects, it is not going to be so impersonal. Most of the children being born today will see well into the 2100s and will be strongly affected by the social upheaval that will result from rising sea level causing human migrations on a grand scale, increased disease vectors, increased loss of agricultural and forest crops from pests, more extremes of storms, rainfall and droughts depending on where you happen to live, salt intrusion into coastal water supplies, melting ice off mountains that normally supply water to millions of people, and many more effects. These will be combined with other problems the world faces from increased pollution, overuse of many resources, increased burden of population increase and dwindling agricultural land areas. Finally, although many animals and plants will be able to adapt to the changes, still many more will not be able to do so, and the continuing drop of biodiversity which lessens our resilience to natural disasters will accelerate. Resource wars are already starting to become apparent and may be linked to rising ethnic intolerance in areas short of water and food. These are likely to increase in intensity. So while most adults today won’t be that much affected, their grandchildren certainly will have to face serious problems of our making if we do not act to control the anthropogenically caused global warming. For my Twitter conversations to clarify my use of terms. OBSERVATIONS. Examples for climate change include temperature, temperature changes, circulation patterns of atmosphere and ocean, energy input from sun, energy losses, back radiation, energy distribution, changes in atmospheric and ocean chemistry and heat content, etc. DATA. Any series of observations or measurements that are used to create descriptions of trends, relationships, models, cause and effect relationships, or test hypotheses. 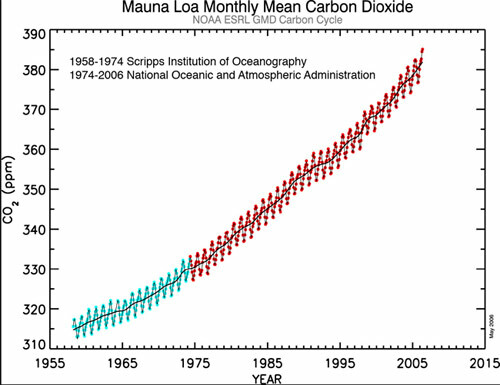 This example is a series of CO2 atmospheric concentration data from the Mauna Loa observatory shown plotted over time. 1) What do we need to know to decide if global warming is happening now or not? 2) What do we need to know to decide if global warming is caused by CO2 and other greenhouse gases or not? If global warming is happening, the average annual temperature of the air over the land and the ocean should be rising. 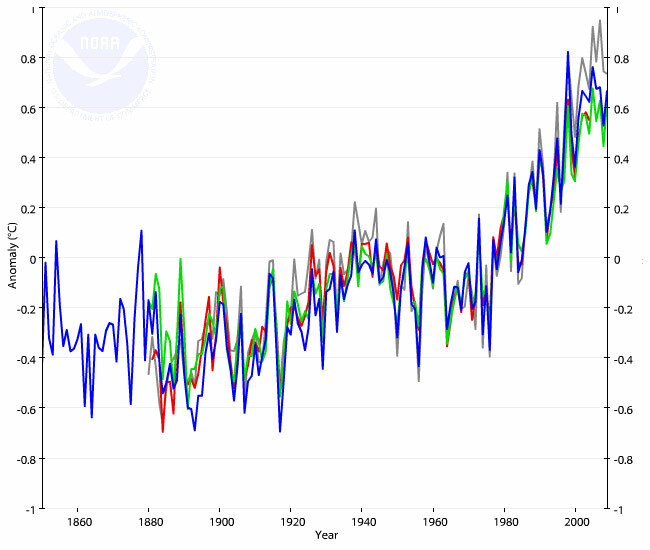 Yes, average annual temperature is rising. If global warming is happening, the average annual sea surface temperature should be rising. The IPCC (Intergovernmental Panel on Climate Change) has become the primary agency, although certainly not the only agency, for advising governments around the world on strategies and actions that recognize climate change as a factor that can affect economies, health, safety, and much more. The IPCC is a governmental organization (not really a scientific organization) although it makes extensive use of scientific and other materials and information to make its recommendations through a series of reports known as Assessment Reports. There have been four such and a fifth (AR5) is due to be completed in 2013 and 2014. A climate model is not CO2 concentration, nor is it Galactic Cosmic Rays or even the changes in the sun’s cycle. It is an entire but simplified reconstruction of the climate to make it easier to predict the future climate. A climate model attempts to incorporate as many of the natural processes that have an effect on the climate.The Community Climate System Model (CCSM version 3) incorporates a very large number of variables and each variable is accompanied by a large database of numerical values that is constantly updated and fed into the computer. There is so much information that only a supercomputer can run the model. 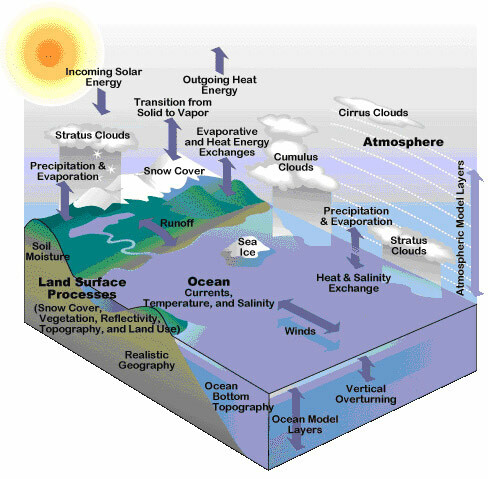 This diagram illustrates the variables that are included in a full climate model. But the picture is only part of the story. Climate change is a fascinating topic from a wide range of perspectives, not the least of which is that if the current hypotheses about global warming turn out to be true, the current uncontrolled experiment in global terraforming could be extremely challenging for all of humankind in the centuries to come. In an earlier blog, I summarized some of the facts and controversy about global warming. If you refer to another earlier blog, however, you will notice that almost every country in the world has a government strategy, or is developing a strategy, on how to adapt to the global warming effects that are most likely to affect their country. In other words most governments accept global warming as a fact and are gearing up to adapt to it. The question in this blog is about anthropogenic global warming (AGW) and what people think about the idea that the global warming trend is actually caused by people, not nature. Climate change is a relatively simple concept. Over the course of the planet’s history, the Earth’s temperature has risen and fallen many times. In the distant past, temperature extremes reflected geological changes of great magnitude, but in relatively recent times, the changes have been more moderate. In examining these charts it is important to recall that these are not actual measurements until we get into modern periods when we actually used thermometers and CO2 direct measurements. The charts of ancient times are based on indirect measurements of temperature, dust, and CO2. So while these are good indications, they are necessarily relatively approximate estimates of the real data at the time. 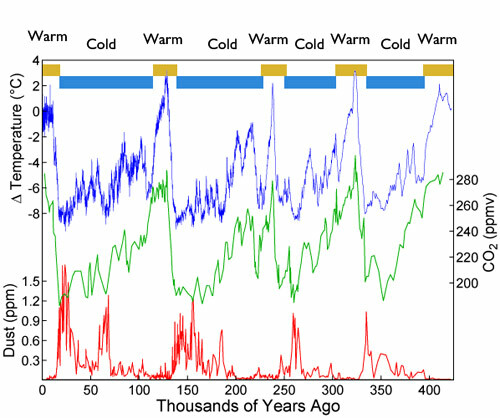 For example in the past 500,000 years (relatively recent times), the temperature has ranged from about 8.5C colder than now to about 3C warmer than now. During that time there were four “ice ages” and five “warm” periods, the last warm period is the one we are in just now. During warm periods CO2 was high, about 250 to 280 parts per million (ppm). During the cold periods the CO2 concentration was about 150 to 220 ppm. At the same time dust in the air was up during cold periods, and down during warm periods. At this point debate about climate change is good but at this stage it will take more than debate to change the minds of government leaders. In most countries, government positions on global warming are already established. They assume global warming is real, but that it will have only a relatively minor impact in the next 100 years, no more than can be handled by adaptation strategies costing less than 1% of GDP on average. Many already have staff devoted to climate change and already have plans, strategies and in some cases have taken preliminary action. Global warming is a conclusion that most climate scientists and scientists in related fields predict based on direct and indirect measurements of CO2, temperature, and sea level rise among other variables. The scientists have predicted that with increasing release of CO2 and other greenhouse gasses, the temperature of the earth will rise in proportion to the addition of the gasses. They further predict that as a consequence of the rise in temperature, there will be both sea and land ice melting that will be of sufficient volume to raise the level of the sea over time. The rise of CO2, temperature, and sea level all have direct and indirect impacts on the physical and biological characteristics of the planet, some of which will be benign, some adverse, some not easily predicted, and some unknown. The end result depends on how much CO2 is ultimately released, but the extreme is probably something like 300 million years ago when the world was much warmer than humanity has ever experienced, had much higher CO2 levels than humanity has ever experienced, had no ice caps, and the sea level was about 70 meters higher than today. This was a period of tropical gigantism. It was followed some 40 million years later by an extremely dry period in which only reptiles and aquatic animals flourished. Dr. Hansen is well-qualified to speak on the subject of global warming and in this lecture describes the underlying principles and evidence for the changes we now observe. He also makes predictions for the future against the accuracy of prediction he has made over the past several decades, all of which are now fact or on the predicted track. Dr. Hansen is the target of attacks about his views of a proposed economic method to reduce carbon emissions and about his claim that NASA tried to muzzle his alarm about climate change. 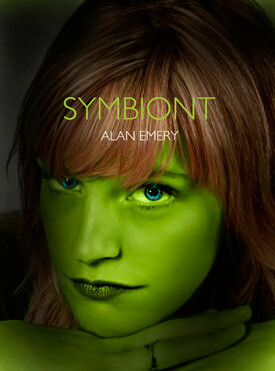 Here is his talk March 10, 2012.